If the first few days of Stanley Cup playoff action are any indication, then we're in for one heck of an NHL postseason. With all eight first-round series underway and a handful of Game 2s in the books, it's safe to say some playoff brackets are already in danger of crumbling, with the runaway favorite Tampa Bay Lightning falling behind 0-2 in their series against the Columbus Blue Jackets and Barry Trotz's New York Islanders already up 2-0 on the Pittsburgh Penguins. Saturday wasn't any less thrilling, with three games going to overtime and three series getting evened up over the course of the day. Keep it locked right here on CBS Sports for live updates throughout the weekend. The Colorado Avalanche capped off their late game comeback and evened up the series with a 3-2 OT win on Saturday. Nathan MacKinnon plunged the dagger into Calgary with this filthy snipe in overtime. What a laser. What a day of hockey. The Flames and Avalanche were locked in a tight 1-1 game when Sean Monahan finally broke the deadlock and found the go-ahead goal with a chip shot past Philip Grubauer. With less than eight minutes remaining in the game, it looked like that might be the game-winner. However, the Avs pulled their goalie for the extra skater and found an equalizer off the stick of J.T. Compher with under two-and-a-half minutes remaining. As a result, we've once again got another overtime game on our hands -- the third of the day. The Bruins continued to have their way with the Leafs in the third period of Game 2 and ultimately took home a 4-1 win to pull even in the series, but the big story from the third period was how things got out of control. Officiating was pretty terrible all night and refs lost control of the game (if they ever had it) and, ultimately, it led to this revenge play from Nazem Kadri, who cross-checked Jake DeBrusk in the face. Kadri and DeBrusk went at it all night and the Leafs center was pushed over the edge over a hit that DeBrusk laid on Patrick Marleau. We may not see Kadri for at least a few games, as it's very possible the league comes down with a suspension as a result of this play -- especially considering he's a repeat offender. The Bruins got an absolute gift in the second period when William Nylander goofed up and allowed Danton Heinen to tuck an easy goal into the Leafs' net, making it 3-0 Boston. Things got a little ugly at the end of the second period when Jake DeBrusk and Nazem Kadri, who had been going at it all night, collided knee-on-knee. Kadri appeared to be injured as a result of the hit but no penalty was called. The Toronto center returned to the game in the third and got Toronto on the board with this deflection. The Predators and Stars will head to Dallas with their series all knotted up at 1-1. Saturday's Game 2 needed overtime to find a winner, but it was Nashville's Craig Smith who netted the decisive tally 15 minutes into the extra frame. He capped it off with an outstanding celebration for good measure. The Bruins had a rough start to the series with a sloppy Game 1, but they came out of the gate mean and with a ton of energy on Saturday night. Charlie Coyle got Boston on the board early with his first playoff goal in a Bruins uniform, but the real highlight of the first period came when David Pastrnak delivered this beautiful spin-o-rama assist to Brad Marchand. The Bruins dominated a scrappy, heated first period and took a 2-0 lead into first intermission at TD Garden. The Stars took Game 1 and Nashville is looking to force a split before the series heads to Dallas, but this game has been up for grabs through the first 40 minutes. The opening frame featured 20 minutes of scoreless action between these two stingy defensive teams. Dallas got on the board first with a goal off the stick of Jamie Benn in the second period. That goal was set up by a tremendous feed from Tyler Seguin, who snuck the pass by a sliding (?) PK Subban in the slot. The Predators were able to tie the score later in the period with a goal from Rocco Grimaldi -- his first career playoff tally. Folks, we've got a Brooks Orpik game-winner in overtime. Yes, that Brooks Orpik -- he of two goals during the regular season. Orpik picked a corner just a few minutes into OT to give Washington the win in Game 2. Brett Pesce lost his stick earlier in that shift and I'm not entirely sure what he was doing on the final sequence, but it appears he forced Mrazek deep in his own net before then proceeding to screen him on the game-winner. Not great. The Capitals grabbed a 3-2 lead in the third period when Alex Ovechkin found Tom Wilson on the rush. Ovechkin's setup was made possible thanks to some free space created by Nicklas Backstrom, who set the pick in the offensive zone. 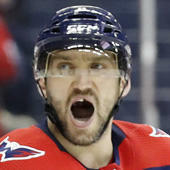 The Capitals were in command until five minutes remaining in the third period, when Carolina once again pulled even on the strength of a Jordan Staal power play goal. Staal deflected a point shot from Dougie Hamilton and watched the puck bounce hard off the ice before making its way past Braden Holtby. Carolina's Petr Mrazek made a number of huge stops in the third period, including one that kept the game tied as time was expiring in regulation. We nearly had a buzzer-beater, but instead we head to OT. There was a bit of a controversial sequence during the second period in Washington and it resulted in Micheal Ferland getting sent to the showers early. As Capitals forward Nic Dowd tried to enter the zone, Ferland delivered a hit that officials determined was a check to the head, earning him a five minute major and a match penalty. Hurricanes coach Rob Brind'Amour was not thrilled with the call because he didn't think Ferland made significant contact with the head. The Hurricanes were able to kill off the five minute penalty and eventually pull even with the Caps in the middle frame. Sebastian Aho netted the equalizer for Carolina. The Capitals sure came to play against the Hurricanes on Saturday. There was no afternoon laziness out of the gate for Washington, as the Caps immediately jumped all over Carolina and jumped out to an early 2-0 lead ... again. Alex Ovechkin has a tremendous shift in the first period in which he back-checked to disrupt a Hurricanes rush, delivered a big hit in the defensive zone, then led a rush and picked up an assist at the other end. Ovechkin set up the first goal of the day with this absolutely filthy dish to Nicklas Backstrom. TJ Oshie got on the board next with a nifty backhander, but the real marquee part of the highlight is Oshie disarming a defender with a karate kick that sent some lumber flying. Just a hilarious sequence. The Hurricanes were able to seize back some momentum with a goal from Lucas Wallmark in the final five minutes of the opening frame.